Logistics firm Stiller Warehousing and Distribution has invested £1.7m in a fleet of 20 new vehicles to keep their truckers motoring millions of miles around the country. 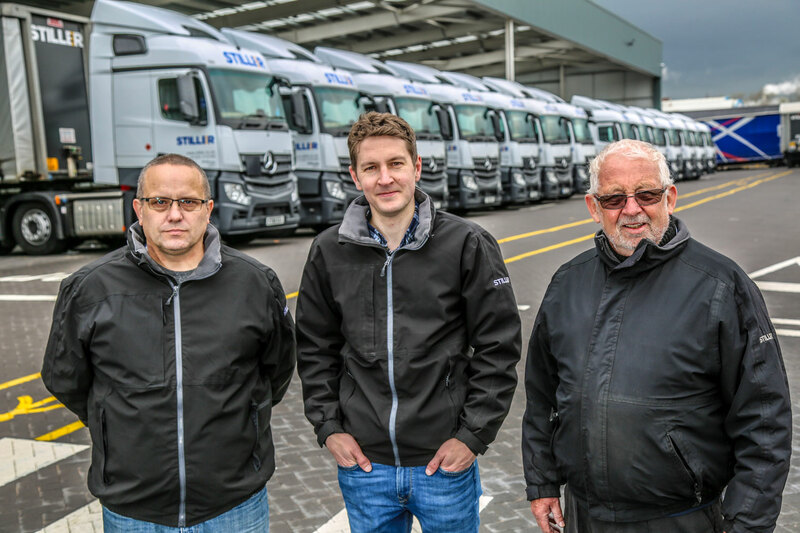 Newton Aycliffe-based Stiller has refreshed its fleet of 45 trucks with 20 new Mercedes Across tractor units, each rated for 44-tonne gross vehicle weight operation. The family-run firm’s vehicles each cover around 95,000 miles a year, totalling 4.3 million miles covering the length and breadth of the UK. To maintain efficiency, as well as safety for drivers, Stiller’s latest trucks are powered by second-generation Euro 6 engines and come fully-equipped with the latest safety features, including radar emergency stop-assist which senses oncoming traffic and automatically brakes. All vehicles also have a recording accident camera set-up fitted along with fixed vehicle phones and GPS trackers, while specially-made full-width vehicle ‘catwalks’ have also been installed, which provide a safer working environment for the drivers when they’re hitching up their trailers. The firm’s managing director Matthew Stiller said: “All vehicles are more fuel-efficient than the units they have replaced, but we’ve really done it to keep on top of our ongoing investment and keeping the equipment we’re running as new and reliable as possible. “We run our trucks 24 hours a day, with each truck double-shifted doing 95,000 miles a year, so it’s essential all our vehicles are 100% reliable. “They’re also safer for our drivers, with the new driver catwalk in particular improving the hitching-up process and minimising the risk of trips or falls. Stiller is also spending a further £200,000 refurbishing 50,000 sq ft of warehousing space to modern standards, including repairing and enhancing the floor, painting and recladding internals and installing modern LED lighting. Once completed in December, the unit will create extra palletised storage space for Stiller which is already close to capacity at its 22-acre Newton Aycliffe site. Earlier this year, Stiller completed work on a £2m 40,000 sq ft palletised distribution centre, which improved its vehicle loading times. Stiller’s latest investment in equipment, people and facilities – including two new warehouses costing more than £1.8m between them – takes the company’s total spend to almost £11m in the last three years. Formed in 1954, Stiller provides cost-effective warehousing and distribution services to businesses in the North-East region as well as commercial property lettings and is also a member and major shareholder in Palletline, a national co-operative network of 70 companies.